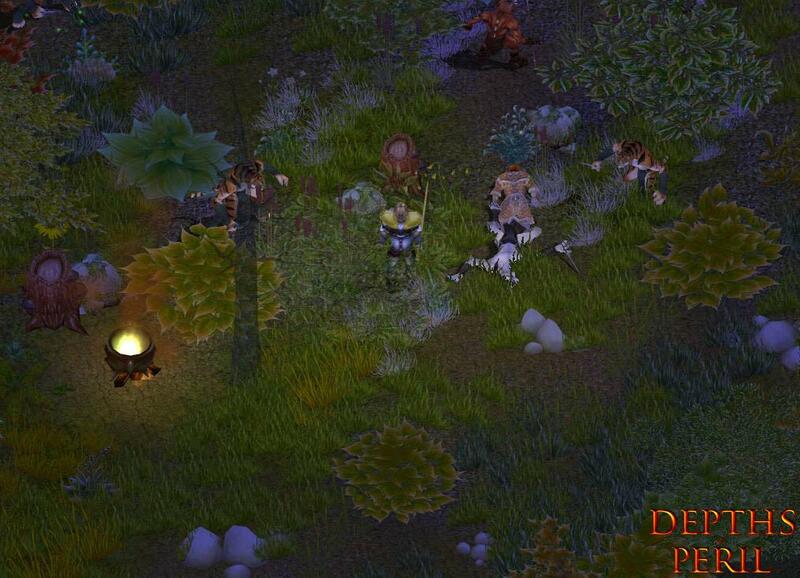 Depths of Peril is a single-player, strategy-heavy role-playing game from indie-house developer Soldak Entertainment. 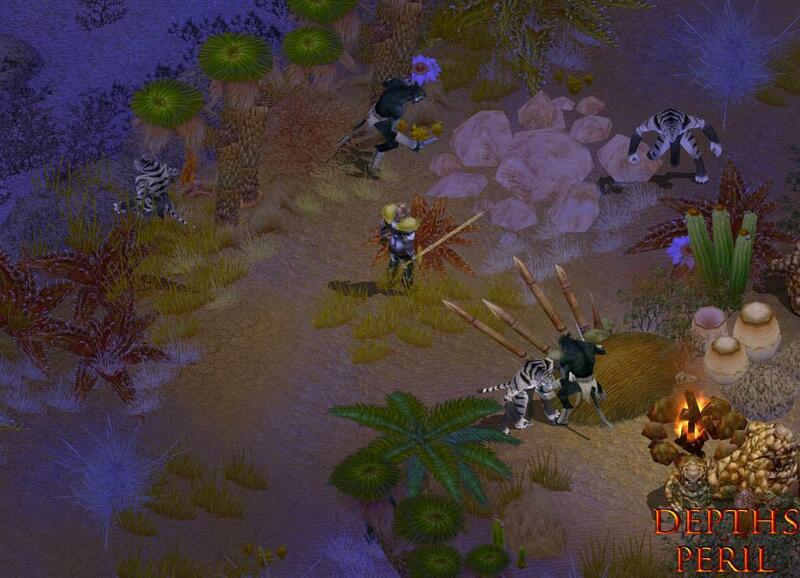 The 3D isometric view is familiar to the Diablo lineage, although the downright panic-inducing real-time strategy elements categorize Depths of Peril as a different kind of animal. In the beginning, you select a class from the warrior, rogue, priest, and mage lineup. Each is scantily equipped to begin with, but the skills, abilities, and inventory built up during the course of the game can be carried forward into subsequent sessions -- even if you lose (which is especially heartening). And on the lowest adjustable settings, the number of times you fail at Depths of Peril will increase the thickness of your skin, or you’ll resort to more violent methods of coping with loss. Regardless, the expected RPG doctrines are fairly adhered to, with quests and monster mashing bestowing experience points. This process levels up your character so that a stack of points may be distributed over the landscape of attributes -- strength, intelligence, etc. -- and a separate stack of points may be distributed across a wide-spanning tree of skills. The quests are standalone in nature, with the overarching meta-narrative tucked away into a copious library of in-game tomes. The groundwork laid for the game’s lore is an urban sprawl of origin myths, war documentaries, racial character profiles, and short fiction, but the gameplay isn’t offended in the least if you ignore (almost entirely) the backstory’s scrolling depth. It’s there for those that need it. The major impetus behind the gameplay is the presence of multiple non-player covenants moving about the map at break-neck speeds, hungry to rob you of your objectives, and motivated to diminish your wealth and influence. Monetary wealth is a largely closed affair between you and Jorvik’s merchants. Swords get longer, shields grow sturdier, and armor gains more and more metal rings attached. Copper, silver, and gold dropped out in the fields of battle, as well as traded for in the marketplace, work to narrow the gap between you and that next piece of slightly higher-grade equipment. Most entertaining, however, are the missions handed out by potential recruits. They essentially place their fighting/healing/magic-using resume out on the table, and allow the competing barbarian covenants to win the recruit over. The recruit will make a certain demand -- collect X amount of materials, slay Y amount of beasts -- that you must fulfill in order to get the recruit onto your payroll. 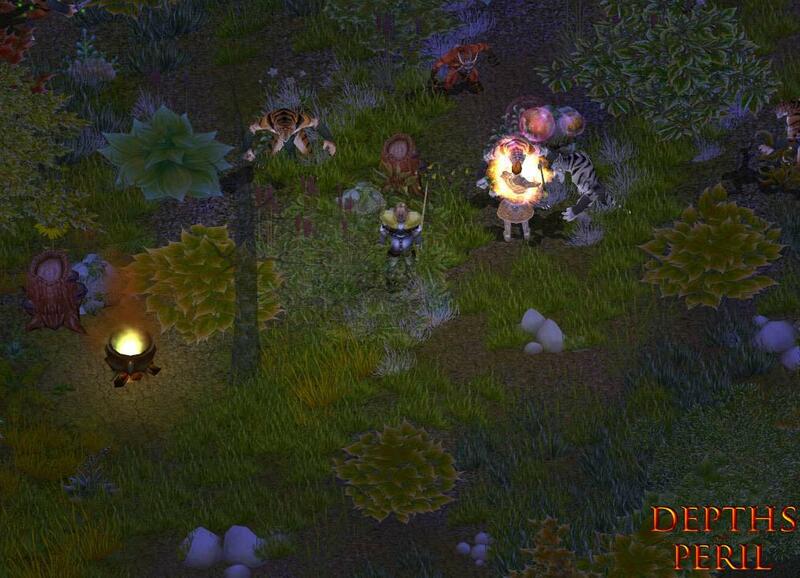 A timer starts counting down, and in case that isn’t enough time-pressure to place on a mission, it’s important to remember that the other NPCs are already out there, scouring the map, snatching up X amount of materials, or slaying Y amount of beasts. Prioritizing recruiting efforts, general quests, and controlling your inventory would be game enough. But Depths of Peril also adds political ingredients to the stew. Negotiating with your fellow barbarians is a fully-realized scenario that takes its cue from Rome: Total War. Money shifts hands, trade routes open and close, equipment is hauled back and forth, all in the name of temporary peace. Because the hands you shake today inevitably become the hands that squeeze your windpipe later. That is, if you don’t manage to ally with the all the remaining covenants, destroy the ones that won’t, and end up with the greatest influence (a measurable stat) by the end game. All of these gears of war clank noisily together, and the momentum driving Depths of Peril is undeniable. There is a wide-ranging monstrous compendium to tackle across the lands of Aleria. The map is randomly-generated from game to game, and the canvas is squarely-cut between pine forests and badlands, homesteads and dungeons. The flora is slathered over the countryside, rarely taking a breather, and the ground maintains a level plane, which makes for oftentimes unmemorable albeit obscuring scenery. 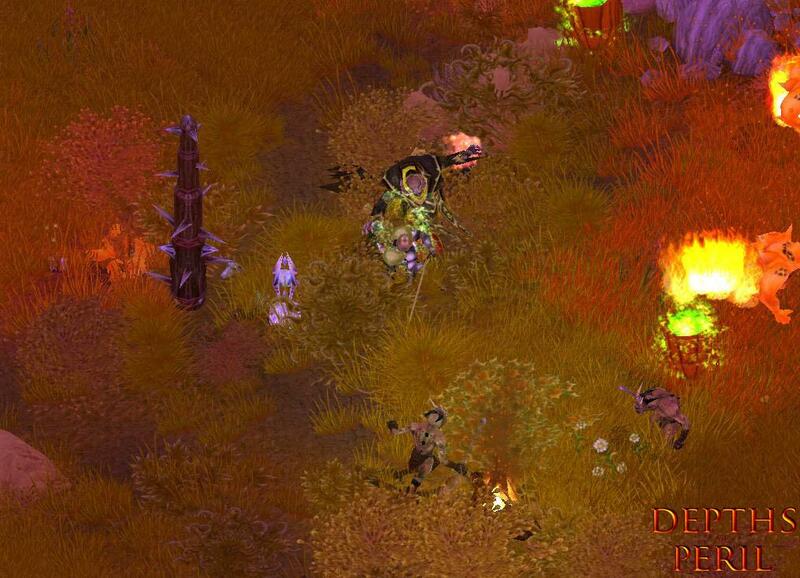 Otherwise, the combat is visceral with its chunky hammer hits, deep-cutting blade action, and glittery spell effects. The beasts of the land gutter and growl with conviction in their roles, and the soundtrack aims for the bold. The difficulty level sometimes spills into outright unbalanced scenarios as, in one game-ending example, multiple bands of Yeti attacked the city of Jorvik. All of the barbarian covenants laid aside their differences to stave off this brutal onslaught -- a noble sentiment, but to no avail. The invading creatures were several levels higher than myself and the other NPCs, and the creatures systematically destroyed every covenant’s house, and murdered every merchant, guard, and quest-giver in the town. I “survived,” though I use that term loosely since I died and was resurrected a couple dozen times before the creatures finally grew disinterested and departed Jorvik. One other covenant had survived the attack, and with no merchants or quest-givers to further interact with (the Apothecary managed to resurrect, but her usefulness is limited) the other house and I were left at a stalemate. And by stalemate, I mean that I raided their home ceaselessly for an hour, teleporting back to my home for healing, and back into their home for slicing and dicing, until I finally resigned from beating my head against that wall. Game over. On one side of the coin, it’s baffling that all the town’s NPCs could be permanently erased from Jorvik. On the other side of that coin, there’s something to be said for dealing with permanent consequences, and the tension that adds to gameplay. At first, it will be an intimidating climb out of the Depths of Peril before you gain solid ground within the game’s universe. The tutorial will open up the rulebook, but composing winning strategies is a trial-and-error procedure that offers no apologies for its tough-as-nails enemy AI, game-ending scenarios, and multi-tasking mechanics. The world is not terribly engaging to explore, despite the dice-rolled layouts, but the enemies you meet can at least take a satisfying beating.